- A fairy with fiery wings and tresses shares a perch with her stone companion. Design is 450 stitches wide by 567 stitches tall. This is a massive project that will provide you with many hours of enjoyment. 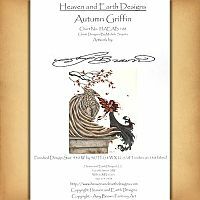 Copyright - Heaven and Earth Designs, Inc. This is a pattern for counted cross stitch. It is not a complete kit. You will need to supply your own fabric and floss. 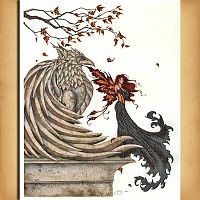 We are not able to offer digital downloads of our patterns at this time. Do you have any other questions about our "Autumn Griffin" Cross Stitch Pattern?